Volkswagen has unveiled its T-Cross compact crossover, marking its debut in the compact crossover segment and further reinforcing its SUV plans. 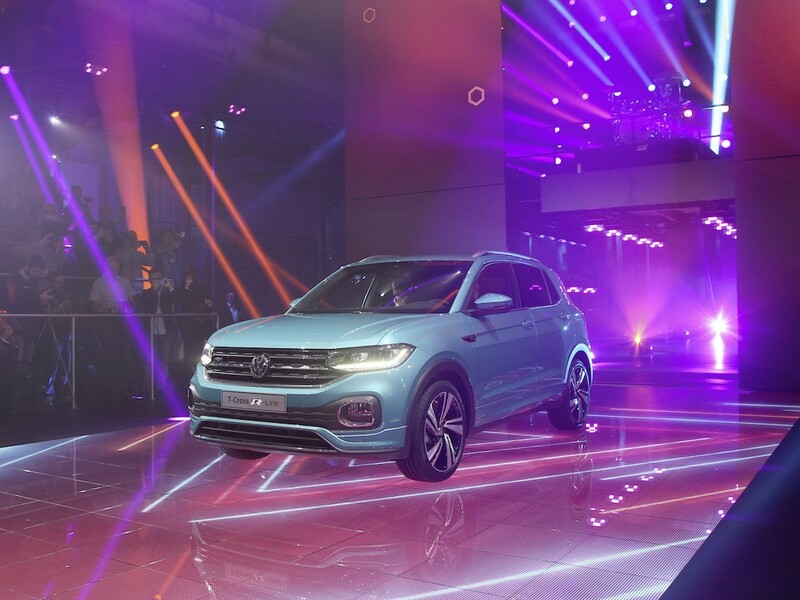 Unveiled in three separate world premieres in Shanghai, Amsterdam and Sao Paulo, the new model is roughly Polo sized and built on the same MQB A0 supermini platform at the Spanish Volkswagen factory in Navarra. It sits at the bottom of the VW SUV line-up, under the T-Roc, Tiguan, Tiguan Allspace and Touareg and launches as Volkswagen steps up its SUV ambitions, planning a line-up of 30 models by 2025 and expecting them to account for half of its global sales by that point – more than twice their current share. The brand is also ramping up for the 2020 launch of its first fully-electric SUV: the I.D. Crozz. “For us, the T-Cross is an incredibly important product. It’s an SUV in the A0 segment, very compact, but offering lots of space and everything you need. There is enough space for everyone in this car and it’s perfectly suited for making its way through the urban jungle. And that’s a lot of fun,” said Ralf Brandstätter, chief operating officer of the Volkswagen brand at the premiere. The five-seater T-Cross will feature a sliding rear seat that can be adjusted for more storage or additional leg room. Engine line-up will include a 1.0-litre TSI petrol with 94bhp and a five-speed manual and a 113bhp version with a six-speed manual, or a seven-speed DSG automatic. The global engine line-up will also include a 1.5-litre 148bhp petrol and a 94bhp 1.6-litre diesel but their availability for the UK has not been announced. All engines are Euro 6D-TEMP compliant. Trim levels will cover S, SE, SE-L and R-Line with full equipment details yet to be announced. However, VW said it comes as standard with a host of driver assistance systems, previously reserved for higher class vehicles. These include Front Assist area monitoring system with Pedestrian Monitoring and City Emergency Brake; Lane Assist lane departure warning system; Hill Start Assist; a proactive occupant protection system; and the Blind Spot Detection lane change assist system with in-built Parking and Manoeuvring Assist. Driver Alert System, automatic adaptive cruise control and Park Assist are also available as options.